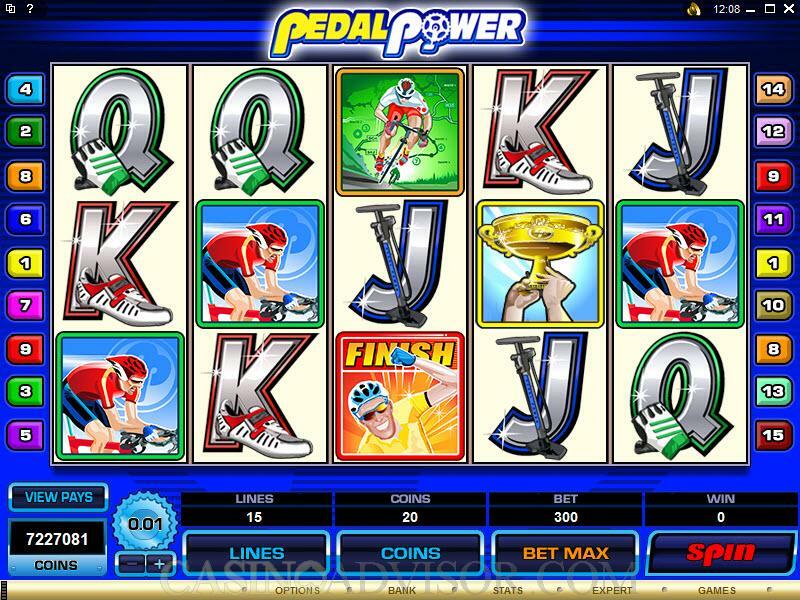 Pedal Power is an online slot game by Microgaming that was released in time for the Tour de France 2009, and celebrates the power of the cycle. This game is a video slot game with 5 Reels and 15 Pay-lines. The large number of pay-lines means that your chances of winning at this game are fairly high, with 36 winning combinations. This game is guaranteed to be a big hit among cycling enthusiasts around the world, whether you prefer the climbs or would like to master the straights. It is a wonderful way to test your power and endurance as you seek the golden trophy in an attempt to win the jackpot. The symbols in this game are broadly divided into three categories which are the High paying symbols, low paying symbols and the special symbols, in total there are 12 symbols, with two special symbols and five each of the high and the low symbols. The high symbols are the Finish, cyclist, racing cyclist, two cyclists and the start symbols the Low symbols are all card faces that range from Ace to Ten. The special symbols are the wild and scatter symbols. The coin denominations of this game range from 0.01 to 0.10 where the player can bet a maximum of 20 coins per pay-line making the maximum bet 300 coins. Since the least bet is $/£/€ 0.01 and a maximum bet of $/£/€ 30, which means that this game is essentially a low-roller and a mid-roller game, and is not suitable for the high rollers. The Wild symbol in this game is the golden trophy. This symbol substitutes for all other symbols to form a winning combination. It is important to note that the wild symbol does not substitute for the scatter symbol and cannot trigger the bonus feature. The scatter symbol is the stopwatch symbol, and can appear anywhere scattered on the reels. Three or more stopwatch symbols complete the scatter winning combination. In addition, three, four or five scatters symbols reward the player with free spins. The unique feature of this game is the ability to choose the number of free spins you would like. You can choose between 25 free spins with a multiplier of 2, or 10 free spins with a 5x multiplier or even 5 free spins with a 10x multiplier. At 10x, the maximum jackpot is a massive 400,000 coins, and at 5x, it is a highly enticing 200,000 coins. It is not possible to re-trigger free spins during the free spin round. 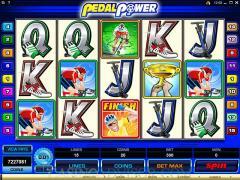 Pedal Power has an additional gamble feature that allows players to quadruple their earnings with this game. 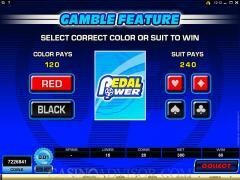 This feature is available as soon as a winning combination appears on the reels, and when the player chooses the gamble feature, he/she is taken to a second screen. Here the player is given a choice between both black/red and a range of four suits. When the player makes a choice, a card is revealed. 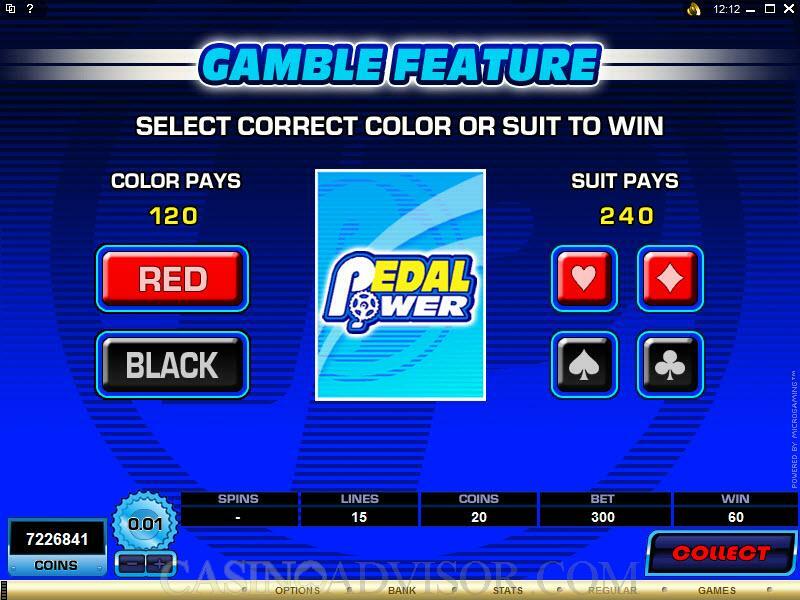 If the player chose the right color, then the payout is doubled and if the player chooses the right suit, the payout is quadrupled. However, if the wrong choice is made, then the player loses the amount. Interested in reading more detailed information about Pedal Power? If so Click Here for more details.